Our 5-day string of beautiful (and comfortable) mid-May weather has come to an abrupt end as steady showers blanketed southern Minnesota this morning. Tomorrow’s forecast calls for thunderstorms that will likely bring more rain to the area (remember, we never got back down below river flood stage), and we might see spotty showers through next Monday before we see dry, sunny weather again. High temperatures are expected to remain in the 60’s and low 70’s for the foreseeable future, with lows in the 40’s and 50’s. 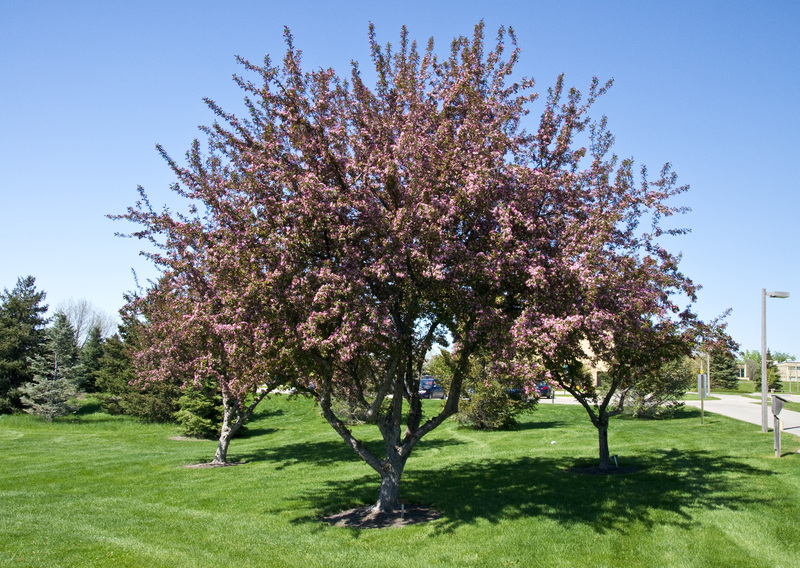 Finally, a good four weeks later than last year (but perhaps only two weeks later than a usual year), St. Peter’s crabapple trees are exhibiting peak bloom. Generally the first week of May is graced with their pinks, purples, and whites, but this cold spring has pushed them back to the third week of the month. Lilacs also began blooming on Monday, and their sweet fragrances can now be smelled throughout the college campus. And this week’s sunny weather has caused just about all the rest of southern Minnesota’s deciduous trees to leaf out, including (in the Linnaeus Arboretum) oaks, ginkgoes, catalpas, and Kentucky coffee trees. 'Red Splendor' Crabapple in bloom north of Interpretive Center, 5/17/11.